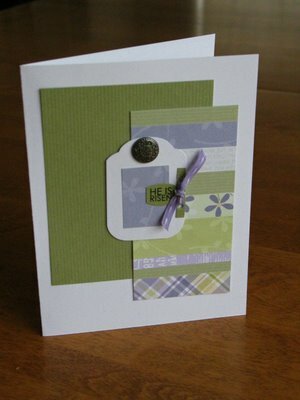 This is a layout I made for the international scrap yourself challenge. The journaling reads: "I am a child of God. I am a woman. I am a wife. I am a mom. I am a daughter. I am a sister. I am a twin. I am a friend. I am a life artist. I am a reader. I am a writer. I am sensitive. I am friendly. I am honest. I am both an introvert and an extrovert. I am genuine. I am caring. I am creative. I am organized. I am structured. I am content. I am thankful. I am loved." Austin has been taking skating lessons since fall. He is in CanSkate and got his level 1 & his level 2 badges this year. Last night was the skating carnival-- their windup and presentation for the year. The theme was Grease. Oh, what a fun time! Austin was one of the football players at the pep rally-- so cute!! They skated to Oh Mickey (You're so fine). 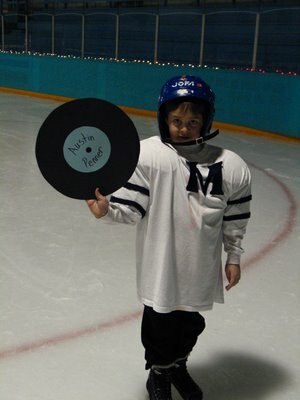 The skaters got chocolate bunnies for participating, as well as a "record" with their name on it. Austin asked me what it was and I had to explain to him what people listened to before MP3s, CDs and cassette tapes! We do this almost everyday. 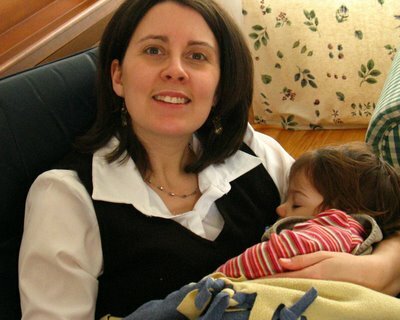 After lunch, we grab Sage’s soother and her blanket and sit together in the navy blue chair in our living room. Jonah often joins us and watches TV on the couch while I hold Sage until she falls asleep. It’s a nice cuddle time that I really enjoy. In the evening, we do this again, after we’ve eaten night lunch & her brothers are in bed. We sit together, I pray for her and she falls asleep in my arms. 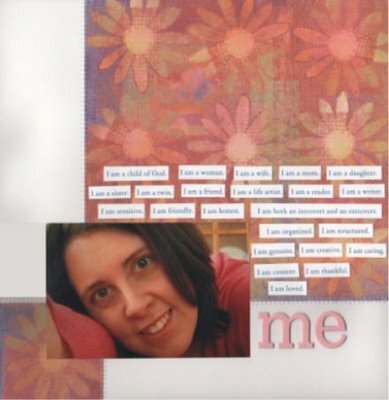 "I introduced my new name for scrapbookers/creative people who are into celebrating life through art: life artist. "Scrapbooker" just doesn't cut it - it is so much more than that name implies. "So who is a life artist? Do you take photos of your family, yourself, your environment, your world? Do you tell stories? Do you bring them all together onto paper, into your computer, onto a canvas (or some other cool concoction)? Do you create art journals with all kinds of wonderfully interesting pieces of your life and thoughts and emotions? Do you celebrate your life through your art? "You are a life artist. "I am a life artist. "And man, I love it." I am a life artist. My mom bought this towel (along with a cat one and an elephant one) for the kids last Christmas. The boys were playing outside after supper (gotta love the longer days!) and I gave Sage a bath. 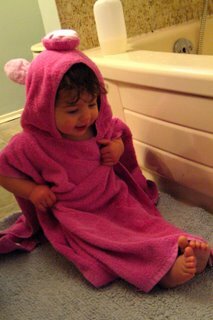 She wasn't crazy about the towel until I started playing "This little piggy went to market..." with her. Then, she was giggling and pretty much just being her adorable self! I am not a camper. I never went camping until I was in grade 11 and didn't take to it well then at all. Cameron and I have camped a few times with friends or while travelling somewhere, but it's not something either of us have really enjoyed. The last time we camped was on the way back from B.C., where I was awakened in the middle of the night by Austin throwing up on MY sleeping bag! Not a pleasant experience at anytime, but especially unpleasant at 7 months pregnant. Needless to say, we stayed in a hotel the next night! Now, however, I have a 3 year old who has been asking me lately if we can go camping. So, because I dislike it so much (& because there is still a TON of snow outside! ), I came up with a good solution. 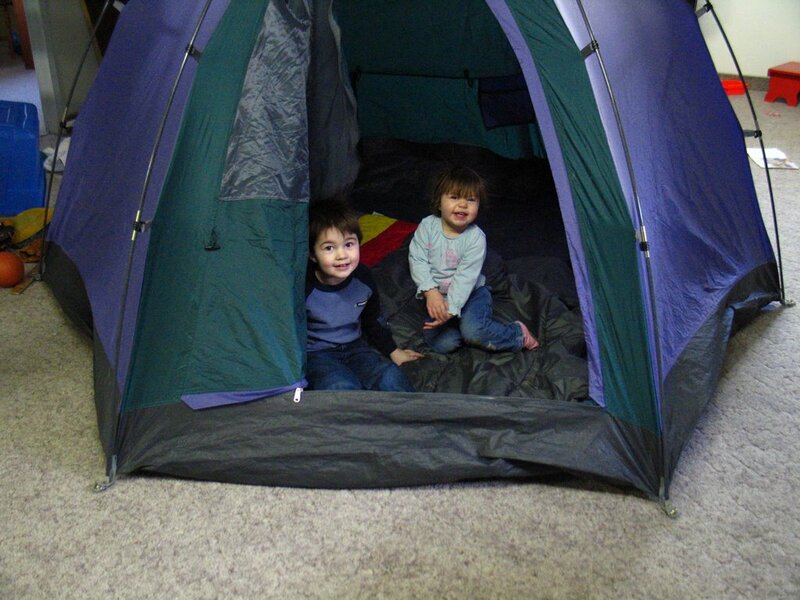 This morning, I set up our tent in our basement so he and Sage could "camp". They loved it! "Welcome to life. Before reading any further, stop. Look around and note five things in your environment, five things that are happening right now. " 2) My laundry is waiting to be folded. 3) Jonah is watching Treehouse. 5)My furnace kicked in, warming up my cold basement. Nothing too exciting, but this is my life on a typical weekday afternoon. 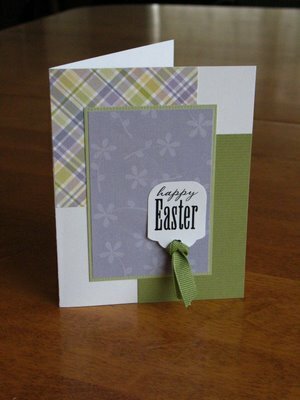 I worked on Easter cards this week to sell in the two stores that sell my LPDesigns cards. I decided to make them without buying anything new, that is, to use up some stuff from my stash. 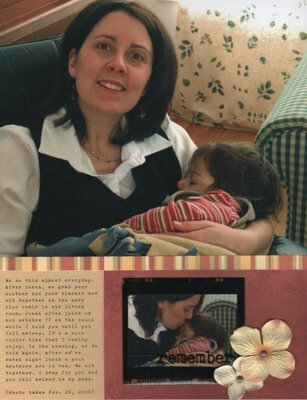 (I think I bought this Chatterbox paper right after Sage was born!) I'm pretty happy with how they turned out. Okay, so I don't actually drink coffee (a friend at church asks me when I'm going to be a grown up and drink coffee!) but I love to go for coffee. With Jonah & Sage as my constant companions, I don't actually get to go to a restaurant for coffee very often. But on Sunday evening, after the kids were in bed and Cameron was settled on the couch, I did get to go out with a friend for coffee. One drawback of the town where we live: the restaurants close at 10pm! So, the waitress let us linger a little longer as she cleaned up. So nice to visit, have a few fries (shh!) and talk without constant interruptions. Then, this morning after taking Austin to school, our team went to another friend's house for coffee. So, my coffee comes in the form of hot chocolate (sugar free, of course! ), but that's okay. It was nice to sit on her couch, with the kids occupied with different toys than they find at our house, and catch up. The days just seem so busy and are flying by, it was nice to reconnect with a very good friend this morning. And now, with Sage asleep and Jonah watching Dora (even Sage can say "doe-a"! ), I'm hoping to get some Easter cards made this afternoon, before picking up Austin and his friend from school this afternoon. Just an example of the not-so-exciting, but ever-so-content-with life I lead! It's so true. I've been talking with a friend lately who always wants to get to the heart-- the centre of us. What really matters. And this can be hard for me. I don't always want to "go deep." Sometimes, shallow seems safest. But this quote reminds me that I'm only going to live a shallow life, if I refuse to "go deep." So, as hard as it can be, that's where I want to go. It was a day off from school yesterday, so I took all three kids into the city to see my mom and do some shopping! We went to Old Navy, where we did pretty well. I've scheduled a professional portrait for Cameron and my 10th anniversary in April, so I was looking for clothes to wear for that. I found a coral cardigan for myself, and a coordinating cardigan for Sage. It's a lighter coral on top, with a strip of cream around the middle and a soft yellow at the bottom (the colours kind of blend into each other), so it's not the same as mine, but it'll match well together in the portrait. I also got her a black t-shirt, because I thought if we take some photos of the three kids together, I thought it would be nice if they were all in black. I got black t-shirts for the boys and Cameron--black with white stitching. (Although, Cameron said he doesn't like the stitching and the one for Jonah is kind of big. So I think I'll return them and try to just find some plain black t-shirts, which could be a challenge. Black is hard to find for kids.) I also ended up buying a black spring jacket for myself at the mall. We went to McDonald's for lunch-- always a hit with the kids! And we didn't stay too long at the mall. We hung out at my mom's condo for a bit in the afternoon, before driving home. All three of my kids fell asleep in the van, which made it a nice quiet drive for me, but a bit of a challenge for bedtime in the evening! I read this quote in a John Eldridge book (Waking the Dead) a few months ago. My friend, Heather, posted it on her blog today. I reminded me of how much I liked it when I read it and how much I struggle with believing that it is true about myself. I can so often swing between believe that I am such a loser and that I am great. I'd love to stop believing the lies that I've been told (that I'm a loser) and start living with the belief, the sure, unshakable belief that I am "brilliant, gorgeous, talented, fabulous." Wouldn't there be a lot more joy in that?